Book's Bok shows off Bertha Hope's vivid imagination as a composer. A separate bass part is available, as is a solo piano arrangement with an exclusive MP3 track. At the jazzleadsheets.com studio, Book's Bok is interpreted by Eric Borczuk, clarinet; Sam Glick, guitar; Ben Caine, piano; Greg Momjian, bass; Cam Johnson. May 3, 2015. Our audio excerpt starts at the melody, but the complete recording sets up the melody with a repeating tutti bass/piano line. The melody is a repeating 16-measure AB form, with the last measure of B at the end of the A section (shortened). The solo section is a four-measure vamp that ends with a cued set up for the reappearance of the melody. The coda gives the drums a little more solo space. A Bass part is available, in addition to lead sheets for every instrument. Bertha titled this composition for her second husband, bassist Walter Booker. A lifelong musician and passionate teacher, Booker abandoned a career in medicine for music, but not before he absorbed anatomy. Using that knowledge, Booker liked to sculpt in wood and stone, signing his pieces "Bok." This is another composition from Bertha Hope's fourth album as a leader, "Nothin' But Love". Check out Bertha's Gone To See T, also on this album. Solo Piano Arrangement: Bertha's solo piano arrangement, plus a recording by pianist Glenn Zaleski (our piano editor), is also available. The piano solo clip piano starts with the repeating bass line mentioned in the description of the lead sheet. Bass part: A separate bass part is available. 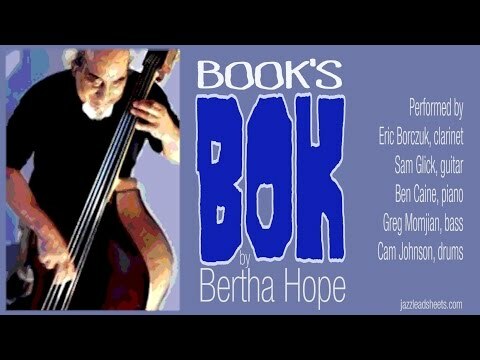 Bertha Hope's composition Book's Bok ranks a 3.5 out of 10 for difficulty and is a really fun way to explore different techniques all bassists strive to perfect: locking into a solid groove with the drums, switching in between 2-feel and 4-feel, and keeping the pulse in a syncopated piece. The anticipated downbeat Hope uses gives the piece its funky syncopation. Locking into a solid groove with the drummer on this piece is extremely fun since together you two can play off of the syncopation and really create a nice dialogue. None of the fingerings or rhythms are too tricky so a bassist at any level can do a lot with this piece. The four-chord progression for the solo section is surprising but fits really well into the landscape of the piece, leaving you space to really lay down a groove, and is a great place to practice alternating between a 2-feel and 4-feel. Use this section to practice your communication skills within the rhythm section and the group as a whole when you practice this piece with others. Make eye contact with your drummer to make sure you two are on the same page about when to go to a 2-feel and when to switch to a 4-feel for each different solo.